From frozen best if deep fried at 350ºF for 6-8 minutes, or if baking, brush with egg wash and bake in a 350 degree convection oven for 6-8 minutes or until internal temperature reaches 165ºF as measured by use of a thermometer. 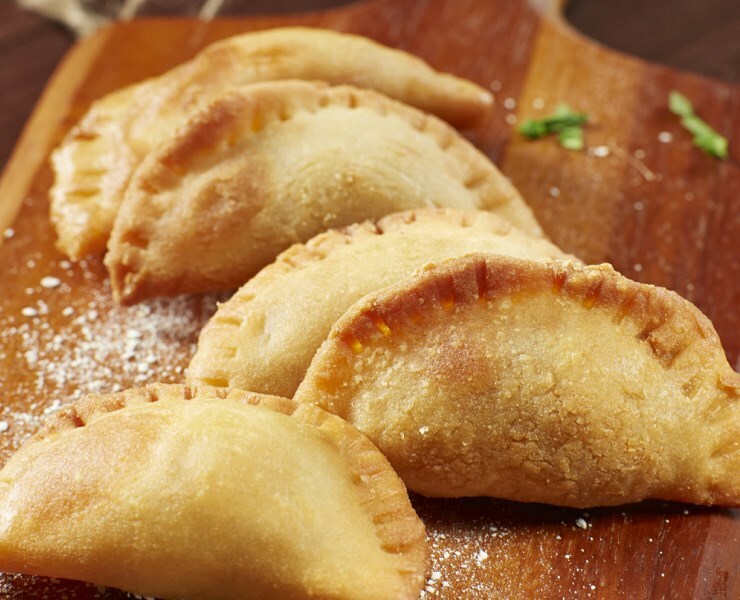 set these demands, Kabobs’ Smoked Brisket Picadillo Empanada provides your consumers with an authentic arepa style pastry from Colombia, with a sweet and savory picadillo inspired mixture. Baked or deep fried, Kabobs‘ Smoked Brisket Picadillo Empanada is ideal as a simple passed hors d’oeuvre / appetizer, resting on a cool guacamole cream or as an accent to a shooter of pozole. Traditional Indian fritter: cauliflower, onions, potatoes, spinach, and jalapeno peppers. *Case count is based on weight - 4lbs; 125 ct is calculated average. A blend of potatoes, peas, onions, carrots, squash, peppers and spices in a triangle spring roll wrapper. Chipotle marinated cubes of sirloin seasoned with an exotic blend of Brazilian inspired spices, hand threaded with onions, poblano and red peppers on a 6" skewer. Fresh shrimp, paired with the smooth buttery flavors of avocado, accented with Monterey Jack cheese, capers, bell peppers, and wrapped in an arepa flour empanada pastry.